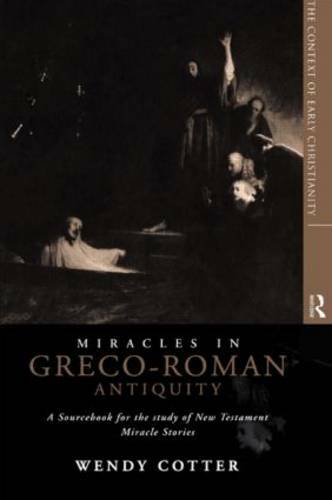 Miracles in Greco-Roman Antiquity presents a collection in translation of miracle stories from the ancient world. The material is divided up into four main categories including healing, exorcism, nature and raising the dead. Wendy Cotter, in an introduction and notes to the selections, contextualizes the miracles within the background of the Greco-Roman world and also compares the stories to other Jewish and non-Jewish miracle stories of the Mediterranean world. This sourcebook provides an interdisciplinary collection of material which will be of value to students of the New Testament. ..." helpful... insightful... This is an excellent collection and will be a helpful textbook." ..."very useful... An extensive bibliography, indices to the ancient texts cited and to the miracles of Jesus as well as a general index to the volume, all make this text eminently "user friendly..." a rich resource... All those studying these miracle traditions will indeed be in her debt." ..."all those interested in the miraculous in the New Testament...will benefit from Cotter's work."